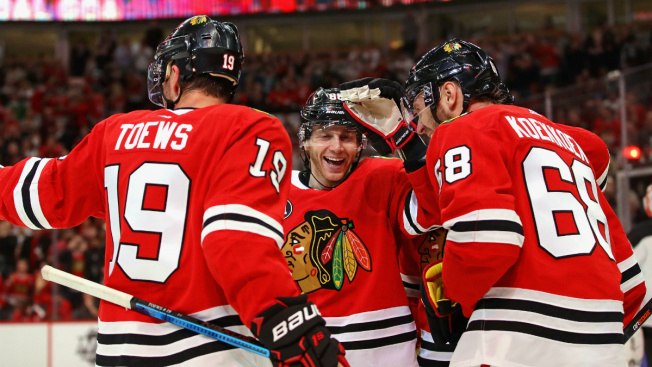 According to the numbers, it sure seems Patrick Kane is at the top of his game. However, the star forward thinks he may be able to reach an even higher level. "Sometimes I feel like I can play better, make better plays, have the puck more out there," said the 30-year-old Kane, now in his 12th NHL season. "It's all a work in progress. Nice to produce, though, so keep going here." Schneider has struggled following offseason hip surgery and an abdominal strain in mid-December. The goalie said he felt strong in this one, but regretted giving up goals to Anisimov and Saad 1:39 apart that let Chicago seal the win. "Just got away from me and us there in a couple-minute stretch there in the third," Schneider said. The Devils dominated early in this one, outshooting Chicago 9-2 midway through the first period and testing Ward. Severson opened the scoring from the right circle 7:14 in. He was wide open and beat Ward on the glove side after taking Brett Seney's cross-ice pass after Chicago defenseman Erik Gustafsson was checked off the puck. Zajac's power-play goal from the slot with 3:18 left in the first made it 2-0. Marcus Johansson fed him from near the goal line to cap a nifty series of quick passes. Kane scored 1:35 later during a delayed penalty call to cut it to 2-1 and quell the Devils' momentum. He beat Schneider through a screen from the slot after skating in from the blue line. "We got a big goal at the end of the first period, gave ourselves a little bit of life," Chicago coach Jeremy Colliton said. "We won the game in the second." Caggiula's 10th goal 20 seconds into the second tied it. Set up by Kane's pass in the slot, Caggiula cut into the right circle and fired a rising shot over Schneider's glove. Toews' 26th goal, with 6:48 left in the second, gave Chicago its first lead of the game. Kane carried the puck over the Devils line on the left side, then dished to Slater Koekkoek. Koekkoek skated ahead into the circle and fed a cross-ice pass to Toews as the Chicago captain dashed in uncovered down the right side. The Devils outshot the Blackhawks 19-8 and dominated for much of third, but Chicago put it away with goals by Anisimov and Saad. After winning a faceoff in the Devils zone, Anisimov skated to the net and swept in rebound of Gustafssson's shot from the blue line with about 6 1/2 minutes remaining to make it 4-2. Saad assisted on the play for his 300th point. "The game's right in the balance at 3-2 with 6 minutes left," Devils coach John Hynes said. "That puck can't get in the net. At that point in the game, we needed better." Saad stuffed in a short-handed goal to finish a breakaway 1:39 later. NOTES: Chicago F Chris Kunitz played in his 1,000th NHL game, and the Blackhawks honored the four-time Stanley Cup winner in a pregame ceremony and with a silver stick. Since the NHL draft was instituted in 1963, the 39-year-old Kunitz is the 32nd undrafted player to reach 1,000 games. ... Chicago G Corey Crawford, out since Dec. 16 with his second concussion in two years, took part in the morning skate on Thursday. ... Devils C Blake Coleman (upper-body) sat out for a second game. Devils: At Minnesota on Friday night to play their third game in four nights. Blackhawks: Host Columbus on Saturday night.